"Most of the English, if they know anything of early history, feel that their Englishness derives ultimately from a predominantly Anglo-Saxon ancestry, with perhaps a romantic tinge, but only a tinge, of later immigrant blood -- Viking, Norman, Huguenot, or whatever. The Britons (and the Romans) play little part in the perception that the English have of their ancestry. Consequently, they see themselves as markedly different from the other ancient inhabitants of the British Isles; and they would never describe themselves as `Celts', unless their recent ancestry included known Scottish, Irish, Welsh or Cornish ancestors." "The [British] women of course would be made slaves, or they would sometimes be married to their masters. Thus there may doubtless be some little British and Roman blood in us, just as some few Welsh and Latin words crept into the English tongue from the very beginning. But we may be sure that we have not much of their blood in us, because we have so few of their words in our language ... Now you will perhaps say that our forefathers were cruel and wicked men ... And so doubtless it was ... But ... it has turned out much better in the end that our forefathers did, thus kill or drive out nearly all the people whom they found in the land ... [since otherwise] I cannot think that we should ever have been so great and free a people as we have been for many ages." The end of Roman rule was a precise cut-off point point. There were few if any Germanic or Irish inhabitants in Britain before the Roman withdrawal. The Britons were left helpless, disorganised and incapable of defending themselves from hordes of invaders from across both North and Irish seas. The invaders were prolific and warlike. 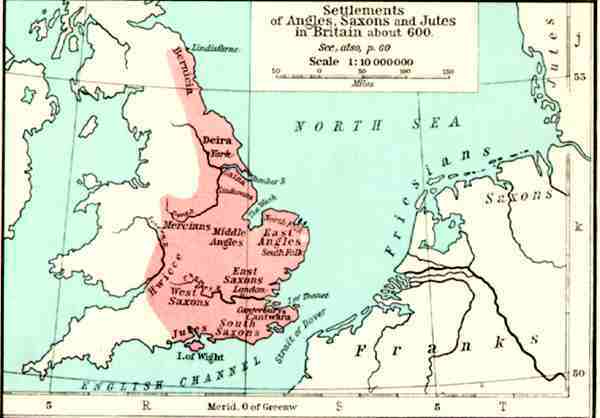 They pushed the Britons into a narrow western strip: Cornwall, Wales, Cumbria and Strathclyde in south-west Scotland. The rest of the island (other than the parts of Scotland inhabited by the mysterious Picts) was repopulated by Anglo-Saxons and Gaels. One brief flowering of British defence, organised by the great King Arthur, halted the invaders' advance for about fifty years. The Cornish and Welsh languages developed from the tongue of the ancient Britons. Conversely, the English language has no Celtic elements and derives from Anglo-Saxon, with substantial borrowings from Latin and (later) Norman French. Gaelic quickly displaced British and Pictish in most of Scotland, eventually succumbing to English. As we can see in Teutonic England, the essence of this interpretation is that England is fundamentally Anglo-Saxon rather than British or Celtic in racial and linguistic origin. Similarly, Scotland owes little to the Brythonic Celts, having been formed by a fusion of the Gaelic west and north (the mysterious Picts duly absorbed) and the Anglo-Saxons of Lothian in the south-east. Acceptance of this approach requires that the Romano-Britons, who numbered in millions, were simply overwhelmed by a few boatloads of invaders and fled to the west or died. Clearly, there is something wrong here! Ken Dark (Britain and the End of the Roman Empire, 2000) uses archaeological evidence to demonstrate a different pattern of cultural division and evolution. He concludes that the Britons were alive and well inside 'Anglo-Saxon' territory for several hundred years at least. Similarly, Martin Henig casts doubt on the interpretation of 'dark age' evidence such as the assumptions that Anglo-Saxons were buried with grave goods and Britons were not (British Archaeology, December 2002). "It is not satisfactory to describe, for example, the warrior buried at Lowbury Hill in Oxfordshire as an Anglo-Saxon - as many have - simply because he possessed a shield and a spear. His iron spear was enamelled, most unusually, in a Celtic style, and he was buried with a hanging bowl also in Celtic style. It looks rather as if he wanted to make it clear that he was British."